The hospital is a strange place. Lying in a hospital bed, patients realize they’re not in charge, and the world could go on quite efficiently without them. Their previous plans are suspended; overturned. The next breath is never guaranteed for mortals such as ourselves, and this fact is brought into acute focus under the florescent lights and among the many noises and beeps of the hospital. Yet the hospital is also wondrous: the self-giving love of nurses and doctors, the wondrous gifts of medicine and technology, the surprising moments of gratitude. But as John Piper argues in Lessons from a Hospital Bed, it’s also wondrous because in these vulnerable moments, God does mighty work through mortal sinners as they cry out in need. Piper seeks to make the most of this opportunity in this small (less than 8,000 words) but substantial booklet. Its chapters are succinct, able to be digested between IVs, X-rays, and the many other tasks occupying hospital patients. It’s direct and focused, pointing to the wondrous God of Jesus Christ in the context of the modern hospital. 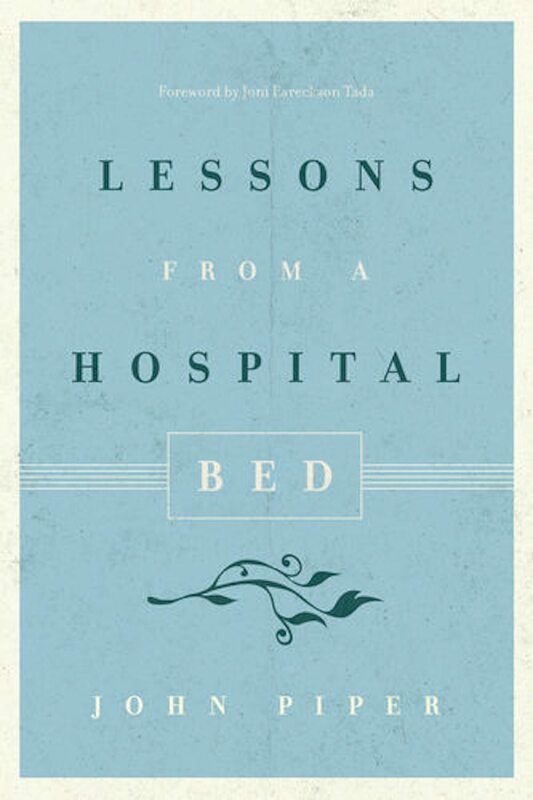 In the book’s first section, Piper outlines “Ten Beliefs I Brought to the Hospital,” relating his core Christian convictions (e.g., creation, sin, providence) to the trials of the hospital bed. The second part of the book gives ten short “lessons” that Piper wrote from his own hospital bed. In these lessons, Piper moves to the realm of personal advice: don’t complain about the medical care; turn off the television; focus upon God’s promises through short, easy-to-remember verses; ask for help; meditate upon your sin and the sweetness of Christ. As a pastor and professor who is also a patient with incurable cancer, I have seen the way in which Christians tend to simply pray for healing and release from the hospital rather than being attentive to how God himself is working in the midst of our physical trials. Piper avoids some common pitfalls I’ve encountered again and again. On praying for healing, Piper wisely avoids dead-ends: “We should ask [God], without hesitation, for healing and for relief of pain.” Yet, “we should trust him with the timing of his answer.” For God may answer “not yet” to those prayers, Piper continues, but will still use your suffering for his purposes, and bring final healing in the end. Piper also avoids the body-denying stoicism that sometimes plagues Christians in the hospital: be honest about your need and your pain, Piper says. Ask others for help, tell your congregation you’re in the hospital, request and receive prayer and assistance. We are so prone to complain. I certainly am. And I am ashamed of it. It contradicts all that I believe about God. It makes him look weak or foolish or inattentive or uncaring or unhelpful. He is none of these. And so my complaining tells lies about him. And I am sorry. . . . [Y]ou don’t need faith to grumble. All you need is your own entitled self. As someone immersed in the cancer community, I know first-hand how hospital patients experience confusion, fear, and anger. Christian patients often wonder how this could be happening. Has God abandoned me? In response, Piper and I both affirm God is faithful to his promises. Moreover, Piper is exactly right in countering a self-absorbed form of complaining—like the Israelites in the wilderness who grumbled as they turned toward their self-made gods. That is a temptation in the hospital like anywhere else. As creatures who completely depend upon God for our life and being, we can rejoice in gratitude that every breath is a gift from God. The psalmist hopes in God’s promise, to be a mighty Savior. But “how long” will he wait before his deliverance? God has promised to remember his covenant people. Why, O God, are you forgetting? God has promised to show his face in blessing to his people. Why, O Lord, are you hiding your face now? Many Christians in the hospital bed worry they can’t bring these questions to God. But I have trusted in your steadfast love; my heart shall rejoicing in your salvation. This stanza expresses the hope undergirding the entirety of this Psalm. Hospital patients need to be reminded that complaining with the psalmist does take faith. We don’t make God look weak or foolish when we join the psalmist in asking, “How long, O LORD? Will you forget me forever?” Instead, we express hope in God’s promises when we wrestle with them in faith. When hospital patients feel their plans for their life and family dissolving before them, they need not pretend that all is well. Rather, they need to move onto a path—of crying to God in lament, a complaint made on the basis of an ongoing trust in God’s promises. John Piper’s Lessons from a Hospital Bed makes a powerful point for hospital patients, pastors, and family members of the hospitalized alike: expect God to be at work and internalize God’s promises in Scripture so that in the midst of the pain and distraction, God’s Word bears fruit. Piper rightly encourages hospital patients to ask their loved ones and community of faith for help, and to pray for healing in a faithful, yet patient, way. In all of these ways, God is active in the midst of the strange yet wondrous place we call the hospital. Yet Piper’s book doesn’t go far enough in addressing the deep feeling of abandonment many hospital patients and families experience when their expectations for the future are shattered. Rather than spurning all complaint in the midst of a crisis, we need to move toward a faithful way of bringing grief, anger, and confusion before the Lord. For we belong to Jesus Christ, who cried in desolation, but also hope, on our behalf: “My God, my God, why have you forsaken me?” Just as the Father didn’t abandon his Son, he will not abandon those who are in Christ, either. J. Todd Billings is professor of Reformed theology at Western Theological Seminary in Holland, Michigan. His most recent book is Rejoicing in Lament: Wrestling with Cancer and Life in Christ (Brazos 2015).